While it is said that a picture is worth a thousand words, the pictures do not even come close to doing this piece justice. Fortunately, words do not fail me as those know who read my descriptions. 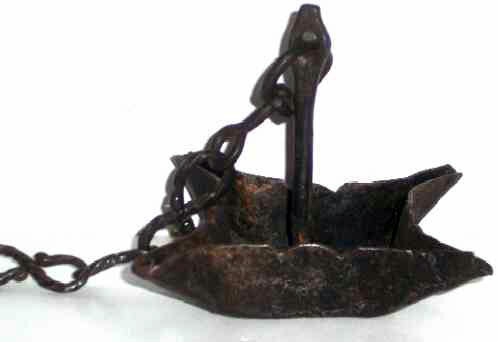 Presented here, an early (last half of the 17th Century), quadruple wick CRUSIE, primitively, but carefully hand crafted in wrought iron. All four sides have a double "V" slot decoration. The superb four "figure 8" large chain links are tightly twisted with "rat tails" at each end of the links. All pieces are hand formed . . . no iron rods, nails, etc as basic stock. 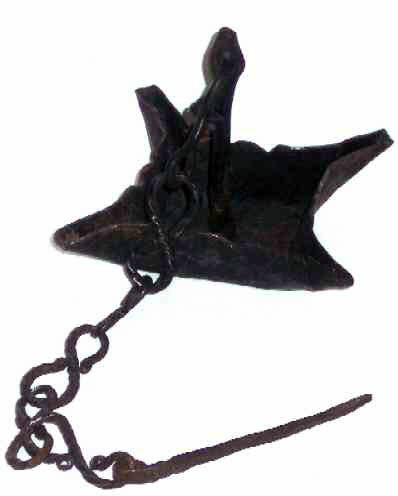 The forged spike, also of twisted iron at the hanger end could be jammed into a beam or wall to provide light where needed. All in all, this is a truly special as well as very early crusie. While a utilitarian piece of early lighting, this hand wrought 4-spout Crusie is a superb example of the art of the blacksmith and can truly be called Folk Art. It's the best we have seen! If you are an appreciator of early wrought iron work, this is a stellar example. Condition is excellent. Size is 4-1/4" x 4-1/4".